My name is Tony Nguyen and I live and work in Oakland, California. I am a father to two little monsters. To pay the bills I am a video producer for a health outfit here in Oakland. My main passion is working on independent documentaries. When and how did your family arrive in the United States? While you were growing up, did they ever talk about their experiences of being refugees? Image courtesy of Tony Nguyen. Growing up, none of my family members talked to me about their experiences escaping Vietnam. It was not until I was in my 30s that I became interested in my past. I made a documentary about my mom and it was during the process of filming that I realized I didn’t know much about my mom’s life in Vietnam or even what she did for a living here - I knew she worked in a factory, but I didn’t know she worked at an ironing board factory, the last one in the U.S.
What was it like for you growing up Vietnamese American in Indiana? In what ways does your family or your culture shape your identity? Seymour, Indiana is a small town, and during the ‘80s, it had a population of around 18,000 people, most of whom were white. Kids would remind me that I was different, like how Vietnamese, not English, was my first language, and how most people didn’t eat the same things that my family did. I even remember how when I walked home from school, people would yell racial slurs at me as they drove by. I had a lot of friends who had my back and who I am still close to, but it doesn’t take away the sting of blatant racism and the experiences that came from it. And I felt different not only because I was Vietnamese, but also because I was poor and from a single-parent household. Everything was interconnected and led me to feel really insecure about myself when I was growing up. My family and culture are core parts of who I am, particularly my identity as a Vietnamese American. My mother came here as a refugee of war: a war that the U.S. was intimately involved with, and which led to the deaths of 3 million people and a lot of other bad things to happen. That history is such a big part of who I am and I want to make sure my kids know about it, but I also want them to learn about my experience growing up in a small town in Indiana. There’s so much more to being Vietnamese American than language fluency and food. Growing up and thinking of myself as Vietnamese, seeing Dustin Nguyen on the TV show “21 Jump Street” was a big deal for me. It was the first time I saw someone who looked like me on screen and also the first time that I found someone who could be a potential role model for me. He had the same last name as me, and he wasn’t a caricature - he wasn’t a wimp, he looked cool, he even made out with a girl in an episode. Seeing this type of representation made me feel so proud. And of course, growing up there was Bruce Lee. While I deeply admire Bruce and I love his movies, I had mixed feelings about him. On one hand, I was excited to see an Asian American on screen, but on the other hand, his roles also perpetuated a lot of racial assumptions and stereotypes. Also, Bruce Lee died before I was born, so it wasn’t until Dustin Nguyen that I felt there was someone in the media of my generation who I could really relate to. I recently took my 11-year old son to go see “Ready Player One,” the Steven Spielberg film. I liked the movie but had an issue with the two young Asian characters. In the book they are ethnically Japanese from Japan so the bowing and accents makes sense, but this film is set in the future in Ohio. All the other people of color in the show have American accents, but not the Asian characters? It’s 2018 and this is just another example of the othering of Asians. My son was excited that there were Asian characters represented, but at the same time even he had questions about their portrayal. It makes me angry when I see how Asians are still always being depicted as Perpetual Foreigners. You currently call Oakland home. How did you end up here, and what roots you to this city? I did my undergrad at San Francisco State University and afterward moved to D.C. for a couple of years, but always missed the Bay. I came back in the early 2000s to do grad work at U.C. Berkeley (in a field I’m not actually working in right now) and ended up staying. I like the East Bay and the fact that there are a lot of Asian Americans here, and a lot of my community work is centered here with this community. How did you get into filmmaking? How do you decide what projects to take on? I got into filmmaking through my community work. 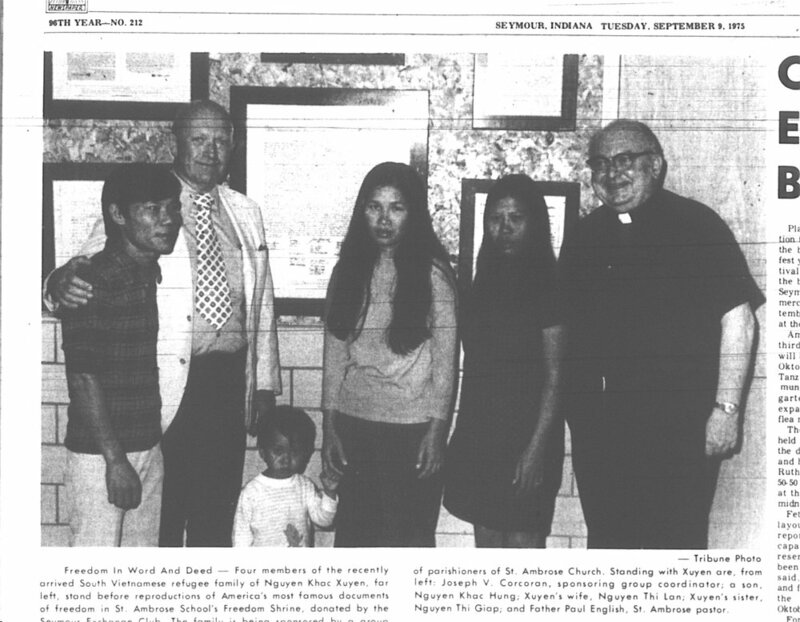 I have been active in the Vietnamese American community for the past 15 years, particularly with the one in the Bay Area, and I found out from some of the OG Vietnamese community folks that there was a string of killings starting in the early ‘80s of people who had pushed the envelope of what was accepted in the Vietnamese refugee community. At the time I was working as a Program Director of an Asian American community program. During my sabbatical, I had the chance to work on something outside but related to my focus, so I embarked on a journey to create “Enforcing the Silence,” a documentary about Lam Duong, a young Vietnamese American who was killed in San Francisco and was one of the first victims in the killing spree. He was a Vietnamese journalist and community activist and had started the first Vietnamese youth center in the country, the Vietnamese Youth Development Center (VYDC) in the Tenderloin neighborhood in San Francisco. From that, I caught the filmmaking bug. I work as a video producer and in that capacity the ideas are a combination of mine and my boss’s. For my own independent projects, some of them come across my lap by accident while others are ones I purposely seek out because I believe there is a story to tell. For example, I have a series of shorts called “The Oakland Shorties” and the first one is about a woman in Oakland who makes a really great fish sandwich. I would eat there all the time and when I saw her, I would always think to myself, “Man, she must have a story.” Then other times, I choose projects because someone’s experience or my sense of their experience resonates with my interests or my background. A few years ago you made an incredible short film called “Giap’s Last Day at the Ironing Board Factory,” which documents your mom’s last day at work before her retirement, but also explores what it was like living in the Midwest as an Asian American as well as provides insight into your complicated mother-son relationship. What motivated you to create this film, and what do you hope viewers take away from it? At first it didn’t start out as a film but rather just footage to have for posterity’s sake - for me, my family, some friends. I had the privilege of working with an incredible longtime filmmaker named Steven Okazaki and he was a major force in encouraging me to transform the raw footage into a movie, telling me that there’s something here, that I should develop this into something more. He was integral in this process, and I feel so lucky to have him in my life and to have his support. My mother had come to Oakland to visit and found out that she was retiring. I had always known that she worked in a factory, but it was not until this trip that I found out it was an ironing board factory. When I found out, in my head I started imagining how the ironing board assembly line might look really cool visually. I also had a free Southwest ticket, so I asked my mom to get permission to film. On the plane, I started thinking about how aside from filming her last day at work, I could ask her questions and put something together. But I didn’t think about all this possibly becoming material to submit at film festivals or distribution or anything like that - I was just thinking about how I wanted to capture this moment for my family. In terms of my mom’s reaction to the film, she has seen multiple screenings of the film, three of which were in Indiana. I think she is cool with the movie, though I know it brings up stuff emotionally for her and for other family members, like the past and things that happened to me that aren’t really happy memories. It’s not easy to put all these things out there, but she is okay with it. This is a personal film because it is about my mother and our relationship. I hope that others, if they have the opportunity to explore the past and learn more about their loved ones, take it. You never know how long you have with them. Personally, my kids don’t get to see their grandmother often because she still lives in Indiana, so I feel that this film can help them learn more about her - what she has been through, what she did for a living, our working class roots, their father’s experience in this country, their legacy. In your film, you also talk about your grandmother and the significant role she had in your upbringing. Can you tell us a little bit about her? My grandmother was an incredible woman who raised my mother and five other kids mostly on her own because my grandfather died when my grandmother was in her early 30s in the 1950s. When my family resettled in Indiana, my mom’s generation had to focus primarily on going to work and making a living, so the childrearing was done mostly by my grandmother, meaning she raised me. She passed away when I was a teenager. Before the embargo between the U.S. and Vietnam was lifted, she somehow moved back to Vietnam but two years into her stay there, she died. She’s the only grandparent I ever knew and she has a very special place in my life, my heart, and my memories. What is some advice you would give to other SEA folks interested in filmmaking? Nowadays, if you can’t figure out something, whether it pertains to editing or shooting or anything, you can just Google or YouTube your question and there are probably a bunch of online resources available. In addition to the online resources, I encourage folks to take as many courses, workshops, or programs as you can, and if there are filmmakers you admire, reach out to them. They might not get back to you but you should still try. I still have a hard time getting rejections, be it for money or access to stories, but I’m not going to throw in the towel. Boston: Wed. June 13, 2018.